Insecticide resistance in Anopheles mosquitoes is threatening the success of malaria control programmes. In order to implement suitable insecticide resistance management strategies, it is necessary to understand the underlying mechanisms involved. To achieve this, the molecular basis of permethrin and DDT resistance in the principal malaria vector, Anopheles funestus from inland Benin (Kpome), was investigated. Here, using a microarray-based genome-wide transcription and qRT-PCR analysis, we showed that metabolic resistance mechanisms through over-expression of cytochrome P450 and glutathione S-transferase genes (GSTs) are a major contributor to DDT and permethrin resistance in Anopheles funestus from Kpome. The GSTe2 gene was the most upregulated detoxification gene in both DDT- [fold-change (FC: 16.0)] and permethrin-resistant (FC: 18.1) mosquitoes suggesting that upregulation of this gene could contribute to DDT resistance and cross-resistance to permethrin. CYP6P9a and CYP6P9b genes that have been previously associated with pyrethroid resistance were also significantly overexpressed with FC 5.4 and 4.8, respectively, in a permethrin resistant population. Noticeably, the GSTs, GSTd1-5 and GSTd3, were more upregulated in DDT-resistant than in permethrin-resistant Anopheles funestus suggesting these genes are more implicated in DDT resistance. The absence of the L1014F or L1014S kdr mutations in the voltage-gated sodium channel gene coupled with the lack of directional selection at the gene further supported that knockdown resistance plays little role in this resistance. The major role played by metabolic resistance to pyrethroids in this An. funestus population in Benin suggests that using novel control tools combining the P450 synergist piperonyl butoxide (PBO), such as PBO-based bednets, could help manage the growing pyrethroid resistance in this malaria vector in Benin. There were an estimated 216 million cases of malaria worldwide in 2016 and 445,000 deaths with 80% of all malaria deaths occurring in Africa . Despite extensive control efforts, over half the world’s population remains at risk and the disease has a massive impact on health and economic development, particularly in Africa . Four species of Anopheles, An. gambiae Giles, An. coluzzii Coetzee & Wilkerson, An. arabiensis Patton and An. funestus Giles, are responsible for most of the malaria transmission in this continent. The transmission role of An. funestus (sensu stricto) is further supported by observations that in many regions of Africa, its infection rate even surpasses that of An. gambiae . Long-lasting insecticidal nets (LLINs) and indoor residual spraying (IRS) are the main malaria prevention interventions . However, the success of these control methods is jeopardised by the development of resistance by Anopheles species to insecticides such as pyrethroids and DDT as seen in the past with loss of efficacy of dieldrin for IRS in west/central Africa [5, 6]. In Benin, due to vector resistance to pyrethroids across the country [7–10], two insecticides of two different classes were used in rotation for IRS: bendiocarb (a carbamate) and pirimiphos-methyl (an organophosphate) . However, DDT is still retained for use in IRS, due to the limited number of cost-effective alternatives . Field studies on insecticide susceptibility carried out as baseline surveys for malaria control programs showed An. funestus to be resistant to various insecticides at various localities [9, 10, 13]. Metabolic resistance is the main resistance mechanism recorded, and cytochrome P450 genes are playing a major role while target-site resistance like the knockdown resistance (kdr) is absent [9, 14–17]. Target site resistance was investigated in the pyrethroid/DDT-resistant population and the fifth and sixth segments of domain II in the sodium channel sequence and no polymorphism associated with resistance was identified [9, 14, 16, 18–20] although some mutations have been detected in Cameroon  and Uganda  but with no association yet established with resistance phenotype. A significant increase in mono-oxygenase activities confers resistance to pyrethroids in An. funestus in Mozambique and South-Africa (southern Africa) [15, 23–25], Uganda (east Africa) [16, 22, 26], western Kenya (east Africa) [18, 22], Cameroon (central Africa)  and in Senegal (west Africa) . Characterisation of the molecular basis of resistance to pyrethroids and DDT in An. funestus from the coastal area of Benin  revealed a predominant role played by the glutathione S-transferase GSTe2. The enzyme encoded by this gene was highly upregulated in association with the presence of an L119F mutation in the substrate binding site conferring a high level of DDT and permethrin resistance . Recently, An. funestus from Kpome, an inland region of Benin has also been shown to be resistant to DDT and permethrin with mortality rates of 9.1 ± 2.5% and 13.0 ± 3%, respectively . However, it remains unknown if the resistant mechanism is the same as observed in Pahou, the coastal area of Benin  or whether different resistance mechanisms are responsible for the spread of resistance across the country. Such information is essential in designing suitable control interventions nationwide and to improve the implementation of resistance management strategies against An. funestus. In this study, using a genome-wide microarray-based transcription analysis, the underlying molecular mechanisms conferring DDT and permethrin resistance in Kpome were characterised revealing that both glutathione S-transferases, notably the GSTe2, and cytochrome P450 genes are the main drivers of resistance. Blood-fed adult female An. funestus mosquitoes resting indoors were collected in houses between 06:00 and 10:00 h from the rural area of Kpome (6°23'N, 2°13'E) a southern inland region of Benin from December 2013 to February 2014. Kpome is a large agricultural setting with the intensive production of tomatoes which mainly serve a commercial purpose and insecticides, mainly pyrethroids (deltamethrin and lambda-cyalothrin), used in public health are also used to protect tomatoes against pest attacks. Mosquito collections and rearing were performed as described previously . Adult female mosquitoes were collected indoor between 06:00 to 10:00 h using electric aspirators. F1 adults were generated from field-collected female mosquitoes using the forced-egg laying method  and were randomly mixed in cages for subsequent experiments. All females used for individual oviposition were morphologically and molecularly identified as An. funestus (s.s.) [10, 28]. Two to five day-old F1 adult female mosquitoes pooled from different F0 mosquitoes collected from Kpome were used for this test. Twenty to twenty-five mosquitoes per tube with at least four replicates were exposed to DDT (4%) and permethrin (0.75%) for 1 h before transferring into clean holding tube with 10% sugar solution. Final mortality was scored 24 h post-exposure. Survivors and dead mosquitoes were conserved for further analysis. In this study, we used the same mosquitoes from the previously published research results  to further describe the molecular basis of the observed resistance in this malaria vector population. Mosquito samples generated from the previous investigation were used for genetic analysis in this work. The susceptible strain used in this study has the same age as the exposed mosquitoes. A genome-wide transcription profiling was performed to detect the sets of genes differentially expressed in relation to observed resistance phenotypes in An. funestus populations from Kpome. The microarray hybridisation for An. funestus was carried out using the 8 × 60 k (60 mer) Agilent An. funestus chip. This Agilent microarray chip was designed using the eArray program (Agilent, Santa Clara, CA, US ) (A-MEXP-2374) by adding the 15,527 expressed sequence tags (ESTs) generated from another transcriptome sequencing of An. funestus  to the previous 4 × 44 k array (A-MEXP-2245) . Each array was designed using 8540 ESTs generated from An. funestus transcriptome 454 sequencing , 2850 An. funestus cDNAs from GenBank and a set of P450 genes from the rp1 and rp2 QTL BAC sequence [31, 32], and the 13,000 transcripts of the complete An. gambiae genome. Moreover, An. gambiae detoxification genes previously present on the An. gambiae detox chip  were added to this. RNA was extracted from three batches of 10 An. funestus females (2–5 days-old) from the following sample sets: alive after exposure to 0.75% permethrin (Resistant permethrin: Rperm) and 4% DDT (Resistant DDT: RDDT), un-exposed to insecticides (Control: C), and from the fully susceptible laboratory strain FANG (Susceptible: S) [a strain originating from Calueque in southern Angola in 2002 which is completely susceptible to insecticides (Hunt et al. ) using the Picopure RNA Isolation Kit (Arcturus, Waltham, MA, USA). The FANG colony was kept in insectary conditions (temperature of 25–28 °C with a relative humidity of 80%) at the Liverpool School of Tropical Medicine where assays were performed. RNA quantity and quality were assessed using a NanoDrop ND1000 spectrophotometer (Thermo Fisher Scientific, Waltham, MA, USA) and Bioanalyzer (Agilent, Santa Clara, CA, USA), respectively. Each RNA sample was used to generate complementary RNA (cRNA) using the Agilent Quick Amp Labeling Kit (two-colour) following the manufacturer’s protocol. cRNAs from the resistant samples (R) were labelled with a cy5 dye, and cRNAs from the susceptible strain FANG (S) were labelled with the cy3 dye. cRNA quantity and quality were assessed using the NanoDrop and Bioanalyzer before labelling. Labelled cRNAs were hybridised to the arrays for 17 h at 65 °C according to the manufacturer’s protocol. Five hybridisations were performed for each comparison including two dyes swap per comparison. Microarray data were analysed using Genespring GX 13.0 software purchased from Agilent (Agilent). A normalisation of the data was performed with the GeneSpring feature extraction program using the lowess normalisation approach. To identify differentially expressed genes, a cut-off of 2-fold-change (FC) and a statistical significance of P ≤ 0.05 with Benjamini-Hochberg correction for multiple testing and Storey with bootstrapping (with a cut-off of 1.5-fold-change for the R-C comparison) were applied. A false discovery analysis was also performed using the Benjamini-Hochberg correction test for multiple testing as implemented in GeneSpring. A qRT-PCR was used to validate the microarrays results for seven of some upregulated detoxification genes. These genes include three cytochromes P450s (CYP6M7, CYP6P9a, CYP9K1), two glutathione transferases (GSTd1-5, GSTe2), and one aldehyde oxidase (Ald oxi). Also, the expression level of CYP6P9b previously found to be strongly associated with pyrethroid resistance [19, 31, 35] and GSTd1-3, a gene shown as possibly associated with pyrethroid resistance by 454 transcriptome profiling [19, 30] were analysed (Table 1). One microgram of the three biological replicates for resistant (permethrin: Rperm and DDT: RDDT), control (C), and FANG (S) was used for cDNA synthesis using Superscript III (Invitrogen, Carlsbad, CA, USA) with oligodT20 and RNase H according to the manufacturer’s instructions. Standard curves were established for each gene using serial dilution of cDNA. qRT-PCR amplification was performed using the MX 3005P (Agilent) system. The relative expression level and fold change (FC) of each target gene in resistant and control samples relative to susceptible were calculated according to the 2-ΔΔCT method incorporating the PCR efficiency  after normalisation with the housekeeping genes ribosomal protein S7 (RSP7; AFUN007153-RA), and actin (Act5C; AFUN006819). A fragment spanning a portion of the voltage-gated sodium channel gene (VGSC), including the 1014 codon (a portion of intron 19 and the entire exon 20, domain II, segment 6 of the VGSC gene) associated with resistance in An. gambiae, was amplified in eleven field-collected females of An. funestus from Kpome using the Exon 19F/KdrFunR2 primers (Exon 19F: 5'-TTT TTA AGC TCG CTA AAT CGT G-3'; KdrFunR2: 5'-CCG AAA TTT GAC AAA AGC AAA-3') [9, 15, 22]. The PCR products were purified using the QIAquick Purification Kit (Qiagen, Hilden, Germany) and directly sequenced. The polymorphic positions were detected through manual analysis of sequence traces using BioEdit. Sequences were aligned using ClustalW , and haplotype reconstruction and analysis were done using DnaSP v5.10 . Kpome sequences were also compared to those previously obtained from Pahou in coastal Benin  and Gounougou in North Cameroon . After the selection of the best model, a maximum likelihood phylogenetic tree was generated for the VGSC haplotypes in the different populations using Mega 6.06 . The level of Kst of pairwise genetic differentiation between the populations was estimated in Dnasp v5.10, and the neighbour-Joining tree was built using Mega 6.06. A set of transcripts were differentially expressed (≥ 2-fold change, P ≤ 0.05) between permethrin resistant (Rperm), susceptible (S) and control (C) mosquitoes (Fig. 1) from microarray analysis. Overall, 3669 transcripts were differentially expressed when permethrin resistant mosquitoes were compared to susceptible strains (1460 overexpressed and 2209 underexpressed), 3617 between C-S (1211 overexpressed and 2406 underexpressed) and 210 for Rperm-C (91 overexpressed and 119 underexpressed). Overall, a total of 40 transcripts were differentially expressed in all the three comparisons. Only the transcript, AGAP011496-PA (Anopheles gambiae str. PEST) was upregulated in Rperm-S, Rperm-C and C-S comparisons with FC of 2.7, 1.5 and 2.3, respectively. No detoxification gene was found in the comparison of the three groups of mosquitoes. Several detoxification genes were commonly over-expressed in the Rperm-S and C-S. Among these genes, the transcripts for glycogenin (Afun000500) and CYP6M7, belonging to the cytochrome P450 gene family, were the most commonly overexpressed detoxification gene in Rperm-S (FC of 36.2 for Afun000500 and 34.6 for CYP6M7) and C-S (FC of 38.1 for Afun000500 and 28.9 for CYP6M7). A transcript from CYP6AA1 was also commonly upregulated in the Rperm-S and C-S samples with FC of 5.2 and 3.8, respectively. This gene is the ortholog of CYP6AA3 in An. minimus, which was shown to metabolise pyrethroids . Other upregulated detoxification genes identified in Rperm-S and C-S comparisons include CYP6Y2 located in the genomic region spanning the pyrethroid resistance rp2 QTL detected in the FUMOZ-R pyrethroid-resistant laboratory strain , as well as CYP6M4, CYP6S1, CYP4K2 and CYP315A1 that were expressed at lower levels (FC < 5) (Table 2). Transcripts from the glutathione S-transferase (GST) family notably from epsilon [GSTe2 (FC of 10.9 in Rperm-S and 15.2 in C-S) and GSTe4 (FC of 3.9 in Rperm-S and 4.7 in C-S)] and delta, GSTd1-5 (FC 2.0 and 2.6 in Rperm-S and C-S, respectively) classes were upregulated. Other genes such as ABC transporter (Afun009697), alcohol dehydrogenases (Afun012461, Afun013797), carboxylesterase (Afun009492), short chain dehydrogenase (combined_c738) and chymotrypsin (Afun013921) were also overexpressed (Table 2 and Additional file 1: Table S1). A comparative analysis of transcriptomes associated with DDT resistance in Kpome showed a total of 2158 transcripts differentially expressed (≥ 2-fold change, FC at P ≤ 0.05) in RDDT-S with 715 upregulated and 1443 downregulated. 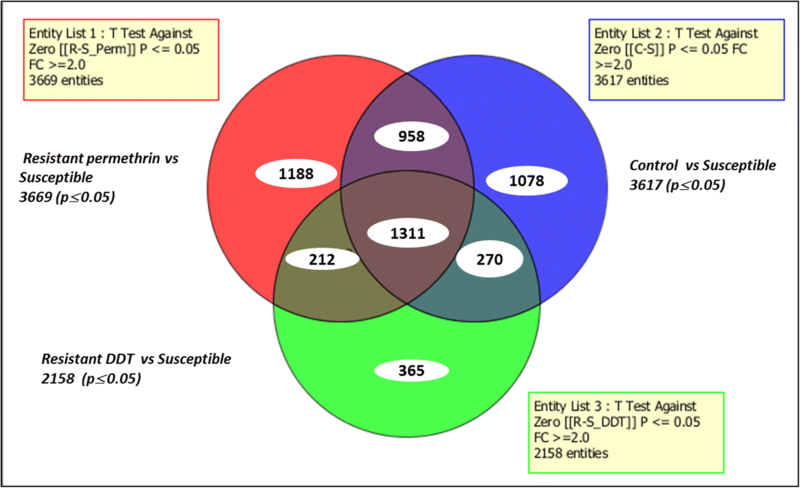 The comparison between RDDT-S, Rperm-S and C-S revealed 1311 transcripts differentially expressed. A set of 212 transcripts was commonly expressed between RDDT-S and Rperm-S, 958 transcripts and 270 transcripts were also expressed when comparing Rperm-S and RDDT-S to C-S (Fig. 2). Many genes were commonly overexpressed in the three comparisons with glycogenin (Afun000500) and arginosuccinate lyase (Afun009227) been the most overexpressed and were consistent in all the three comparisons with fold change of (FC 36.2, 38.1 and 41.4) and (FC 22.2, 23.3 and 25.6) in RDDT-S, Rperm-S and C-S, respectively. Among the common detoxification gene families identified, the GSTe2 gene (Afun000045) was the one that remained highly upregulated with FC of 13.3, 10.9 and 15.2 for RDDT-S, Rperm-S and C-S, respectively. The CYP6M7 gene was also overexpressed in all three comparisons; FC was 34.6 in Rperm-S and FC 28.9 in C-S but with lower FC of 4 in RDDT-S. Several other genes of the family of P450 such as CYP6AA1, CYP6M4, CYP6Y2, CYP4K2 and CYP315A1 were also upregulated. Other transcripts of the GST family were also upregulated such as the Gste4 (FC 4.3, 3.9 and 4.7 in RDDT-S, Rperm-S and C-S, respectively) and the GSTd1 (FC 2.2, 2.0 and 2.6 in RDDT-S, Rperm-S and C-S, respectively (Table 3 and Additional file 1: Table S2). A limited number of genes were commonly overexpressed in these two “resistant” comparisons, potentially as a result of induction or greater involvement in resistance than in control samples. The transcript of alcohol dehydrogenase (Afun011037) was the most overexpressed in RDDT-S, and Rperm-S comparison with FC 6.5 and 3.7, respectively. Other genes of the P450 family including CYP4H18, CYP9K1, CYP9J3, and the esterase b1 were also overexpressed (Table 3 and Additional file 1: Table S2). The transcript (combined_c738) belonging to the short-chain dehydrogenase gene was the most commonly upregulated in the RDDT-S, and C-S comparison with FC 10.4 and 15.9, respectively. The cytochrome P450 gene CYP307A1 was also upregulated with FC 3.3 in RDDT-S and FC 2.2 in C-S. The CYP6P9a gene, reported to be upregulated in southern Africa mosquitoes, was also upregulated with FC 2.8 and 2.3 in RDDT-S and C-S, respectively. Other genes with a known association with insecticide resistance were also upregulated in Kpome mosquitoes as shown in Table 3 and Additional file 1: Table S2. Genes identified from these comparisons include the alcohol dehydrogenase gene (Afun012461 ortholog of AGAP000288 in An. gambiae) which is consistently upregulated in Rperm-S (FC8.4) and C-S (FC10.9) but not in RDDT-S. Similarly, the aldehyde dehydrogenase (Afun008026) and the ABC transporter (Combined_c1762) were also upregulated in Rperm-S and C-S exclusively although with lower FC. Some detoxification genes specific for RDDT-S comparison were identified in Kpome. These genes include alcohol dehydrogenase Afun013475 (FC 3.2), the most upregulated gene (FC 3.2) as well as CYP302A1 (FC 2.6), CYP4D15 (FC 2.4), CYP4J5 (FC 2.2), gb-CYP12F3 (FC 2.1) and the cytochrome P450 (Afun010630) (FC 2.1). For Rperm-S comparison, the ABC transporter (Afun007722) was the most upregulated gene with a fold change of 3.2. Also, the carboxylesterase (Afun012261) (FC 2.8), the cuticle protein (CD5773231) (FC 2.4) and the aldehyde oxidase (Afun00493) (FC 2.4) were upregulated. A qRT-PCR analysis revealed that GSTe2 is the most overexpressed genes in DDT and permethrin resistant samples (FC 16.0 and 18.1, respectively) analysed in this study. However, the expression level of the detoxification gene, CYP6M7 recorded with the qRT-PCR analysis was lower (FC 1.4 and 1.7 in permethrin and DDT resistant samples, respectively) compared to expression level from microarray analysis (FC 34.6 and 4.0 in permethrin and DDT resistant samples, respectively). The GSTd1-5 and the GSTd3 were significantly upregulated in DDT resistant samples (FC 12.5 and 6.2; P < 0.01) compared to permethrin resistant samples (FC 0.72 and 0.86; P < 0.05) (Fig. 3a, b). Amplification and sequencing of a fragment (a portion of intron 19 and the entire exon 20, domain II, segment 6) of the VGSC gene showed that both L1014F (TTA-to-TTT) and L1014S (TTA-to-TCA) kdr mutation commonly found in An. gambiae are absent in this mosquito species. However, further analysis with 837 bp of common sequences generated from the eleven mosquitoes analysed revealed 12 polymorphic sites with 12 haplotypes (Table 4, Fig. 4) showing a high genetic diversity of this gene within the An. funestus mosquitoes of Kpome. No amino acid change was detected in the Benin population. Furthermore, the Tajima D and Fu and Li D* statistics (Table 4) were not statistically significant. The Neighbour-joining tree showed low genetic differentiation between Benin populations compared to Cameroon samples with respect to geographical distance (Fig. 4). The WHO Global Plan for Insecticide Resistance Management  highlights the necessity to detect and monitor the development of insecticide resistance and characterise the underlying resistance mechanisms to maintain the successes in the reduction of malaria cases across Africa. In this study, we elucidated the molecular basis driving DDT and pyrethroids resistance in an inland An. funestus population from Benin. Transcriptional profiling results and the absence of kdr mutation points out to a possible metabolic mechanism driving permethrin and DDT resistance in An. funestus from Kpome notably through overexpression of genes involved in insecticide detoxification such as cytochrome P450 genes, GSTs, aldehyde oxidases, and other gene families previously associated with resistance of An. funestus to insecticides . The cytochrome P450, CYP6M7 was the most overexpressed detoxification gene in permethrin exposed mosquitoes compared to the FANG susceptible strain as well as to the unexposed mosquitoes from microarrays analysis. However, this consistent information from microarray analysis was not confirmed by qRT-PCR. This discrepancy could be associated with the high genetic redundancy of some P450 genes and a high level of sequence similarity between different genes. These factors could lead to cross amplification contributing to homogenise the expression between samples. It is more likely that CYP6M7 could also be a key pyrethroid resistance gene in Benin, but further validation is required. New approaches with RNAseq could help to confirm the expression pattern of this gene. On the other hand, only one gene (AGAP011496-PA) was commonly expressed in Rperm-S, C-S and Rperm-C comparisons. This could be due to the high resistance recorded against permethrin suggesting a less significant difference between the resistant and the control. Such a low number of differentially expressed genes between R-S and C-S comparison is commonly observed in similar studies when the resistance level is high in the population as it is the case here in Kpome [24, 27]. This is because both non-exposed (control; C) and alive mosquitoes after exposure (resistant; R) are all resistant which leads to less difference in the level of gene expression fold change between these two comparisons. 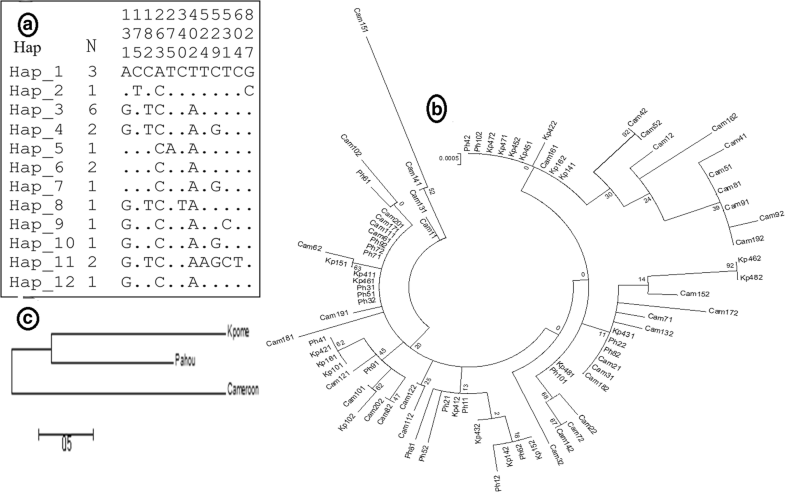 The GSTe2 gene was the most upregulated gene in both DDT and permethrin resistant samples showing that this gene is likely to be involved in both DDT and permethrin resistance as previously shown in coastal Benin . Hence, such genes could confer cross-resistance to both insecticides, and this represents a challenge for the success of the malaria control program. The enzyme encoded by this gene was shown to be able to metabolize both DDT and permethrin . QRT-PCR confirmed the expression level of GSTe2 in permethrin, DDT resistant and unexposed mosquitoes compared to the susceptible FANG. This observation is in line with the common implication of the GSTe2 gene in permethrin and DDT resistance in the An. funestus population from Pahou (Benin) reported by Riveron et al. . Furthermore, the potential role of GSTe2 in permethrin resistance observed here has been shown in previous reports that suggested that orthologs of GSTe2 in other insects are associated with pyrethroids resistance. Indeed, the elevated GSTe2 expression has been associated with pyrethroid resistance by acting as a pyrethroid-binding protein and sequestering the insecticide  or by protecting against oxidative stress and lipid peroxidation induced by pyrethroid exposure . In the yellow fever mosquito Ae. aegypti, a partial knockdown of the ortholog of GSTe2 led to increased mortality to pyrethroids (deltamethrin), indicating that GSTe2 is also associated with deltamethrin resistance in Ae. aegypti . Moreover, the over-expression of GSTe2 was observed with the high frequency of the 119F resistant allele in Kpome (91% of 119F/F homozygote resistant genotype) . The near fixation of 119F-GSTe2 resistant allele in Kpome, which enlarges the substrate binding sites to increase DDT metabolism , coupled with the high overexpression of GSTe2 highlights the key role played by this gene in DDT resistance as previously observed in Pahou. Orthologs of GSTe2 have also been shown to be associated with DDT resistance in other mosquito species such as An. gambiae and Ae. aegypti [33, 44, 45]. Overall, GSTe2 can confer resistance to DDT and permethrin, and this cross-resistance to pyrethroids is of significant concern for malaria control as GSTe2 could protect mosquitoes against the major insecticides used to impregnate LLINs in public health. However, the overexpression of several genes from other gene families in this study highlights the complexity of resistance mechanisms suggesting the involvement of other genes than just GSTe2. In addition, the transcription profile of the duplicated genes CYP6P9a and CYP6P9b (which can metabolise both types I and II pyrethroids as shown by Riveron et al. ) in pyrethroid resistance in Kpome is different to that observed for An. funestus population in southern Africa. Indeed these P450 genes were highly upregulated in pyrethroid-resistant laboratory and field population from southern Africa [9, 15, 16, 31, 46, 47] while a lower level of overexpression was recorded in Kpome. The level of expression of CYP6P9a and CYP6P9b recorded in Kpome An. funestus population is similar to what was observed previously in Pahou population (coastal Benin). This result suggests that the two duplicated P450 genes are not strongly associated with permethrin resistance in Benin as observed in Mozambique (southern Africa) [15, 35]. Therefore, the molecular basis of the pyrethroid resistance in Benin is most likely different to that in southern Africa pointing to independent selection events of the pyrethroid resistance across Africa probably under different local selective forces. These different selective pressures could be increased of ITNs coverage across Benin, agricultural use of pesticides [48, 49] and spilt petroleum products . In most African urban areas, insecticides are used for domestic purposes, including the control of mosquitoes in the form of mosquito coils, fumigation bombs or sprays . These insecticides are used in an uncontrolled and heterogeneous manner in term of coverage and doses of insecticides in each household. Such practices may represent an additional selective pressure favouring pyrethroid resistance. The presence of agrochemicals, or industrial pollutants and plant compounds in mosquito breeding sites could also affect insecticide tolerance by modulating mosquito detoxification systems . Concerning DDT resistance, in addition to the GSTe2 gene, two other detoxification genes of GST family were also upregulated: GSTd1-5 and GSTd3. GSTd3 was shown to be upregulated in DDT-resistant An. arabiensis from an urban site in Burkina Faso . GSTd1-5 have been previously implicated in coding for enzymes that directly metabolise DDT or have at least been previously associated with the DDT-resistant phenotype [54, 55]. Further validation of the role of these genes in DDT resistance is required. The two duplicated cytochrome P450 genes, CYP6P9a (FC = 3.7) and CYP6P9b (FC = 3.9), which confer pyrethroid resistance in southern African populations of An. funestus  were also upregulated in the Benin population. However, because their encoded proteins are unable to metabolise DDT , these genes are not likely involved in DDT resistance observed in Kpome mosquitoes. Nevertheless, further investigation is required to validate this hypothesis. Monitoring the insecticide resistance mechanisms that occur within a population should be an essential component to all insecticide-based vector control programs and improving resistance management involves a better understanding of resistance mechanisms. These data contribute to the growing body of knowledge focussed on pyrethroid and DDT resistance in Benin. This situation emphasises the need for natural resistance and vector monitoring so that adjustments to control programmes can be made timeously and accurately. Mechanisms of DDT and permethrin resistance are likely not associated with target site resistance as no kdr mutation was detected in analysed mosquitoes from Kpome. L1014F or L1014S change commonly associated with pyrethroid/DDT resistance in An. gambiae was not detected in this population of An. funestus, as it was also the case for all populations of this species, analysed so far [9, 19–22]. This suggests that the VGSC is probably evolving neutrally in DDT and permethrin resistance in An. funestus population. Furthermore, the neutrality tests with Tajima D and Fu and Li D* statistics revealed no signature of directional selection on the sodium channel gene suggesting the limited role of knockdown resistance in both DDT and pyrethroid resistance in An. funestus in Kpome. The neighbour-joining tree revealed that Kpome mosquitoes cluster with Pahou mosquitoes while they are different to Cameroon mosquitoes. This reveals a reduced gene flow between these populations probably through isolation by distance which can also affect the spread of insecticide resistance genes in this species as previously shown for An. funestus populations across the continent . Metabolic resistance is likely driving resistance to both pyrethroids (permethrin) and DDT in the major malaria vector An. funestus in Benin. The glutathione s-transferase gene, GSTe2 is playing a key role in DDT resistance and most likely is responsible for the observed cross-resistance to pyrethroids in An. funestus populations from Kpome and such cross-resistance should be taken into account for the implementation of future insecticide resistance management strategies. Moreover, this study provides knowledge on the resistance profile and underlying resistance mechanisms to the available insecticides in An. funestus, a less studied malaria vector in Benin, in order to develop better insecticide resistance diagnostics. 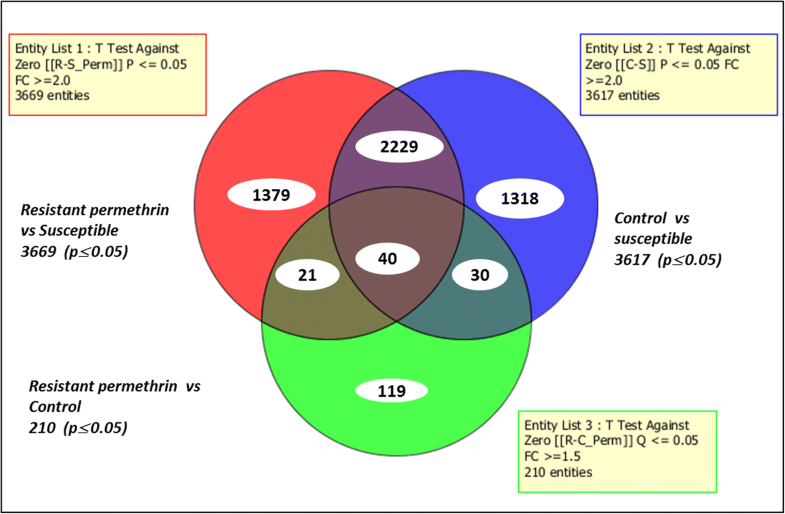 Further investigation should be performed on the expression level of target genes to ascertain the role of metabolic mechanisms in DDT and permethrin resistance in this An. funestus population. Resistance mechanisms detected in this studied population appear to be different from those identified in other African regions showing the need to characterise mosquito populations at country-level for more appropriate and tailored control interventions. Genevieve Tchigossou and Rousseau Djouaka contributed equally to this work. We appreciate Kpome community for their cooperation during fieldwork. We thank Innocent Djegbe, Eric Tossou, Gareth Weedall, Claude Gande and Murielle Soglo for their technical assistance and relevant advice. The Wellcome Trust supports this work grants Reference 099864/Z/12/Z awarded to RD and a Wellcome Trust Senior Research Fellowship in Biomedical Sciences to CSW (101893/Z/13/Z). RD and CSW designed the study. GT and RA carried out mosquito collection and GT, RA, AM and JR reared mosquitoes and performed WHO bioassays. GT and HI performed microarray, qRT-PCR analyses and sequencing of resistance genes. GT, JMR and CSW analyzed data. AY gave advise on the study design and contributed to the implementation of the study. GT, RD, AY, JMR and CSW wrote the manuscript. All authors read and approved the final manuscript. Verbal consent was obtained from household heads before mosquito collections.